A riot of prints and colours. The creativity of Roberto Cavalli in his spring/summer 2015 collection for children is an invitation to travel, to discover new worlds. A flight on the wings of fantasy, from the secrets and wonders of coral reefs, to the unexplored nature of the savannah, to Florentine gardens bursting with flowers and lemons. Already the spring preview, with a pre-collection of over a hundred garments, is alive with fresh, strikingly colourful proposals, created for all age ranges. 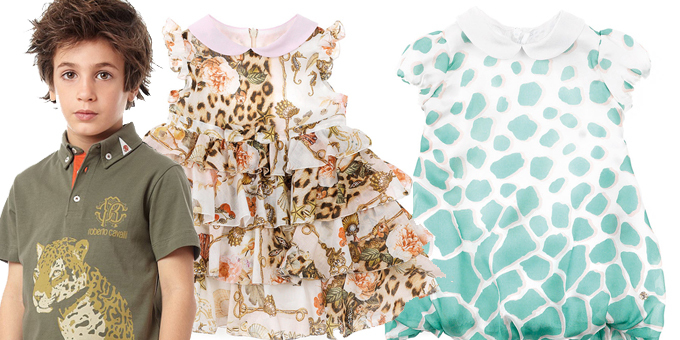 For new-borns and girls, the key theme is the animalier print, featured as an all-over motif, onto which are added bold decorations such as corals and shells, often embroidered or screen-printed. A selection that performs a range of different functions: from little jersey dresses to tops and onesies for everyday use, to more elegant outfits made for special days, with more elegant cuts, structured forms and a range of fabrics enhanced with the inclusion of duchess satin. Floral motifs in a maxi version and in two-tone prints encompass a variety of reds, from pink to coral, combined with pearl. These colours go beautifully with the palette chosen for little boys, which confirms the choice of red, but tends towards more rusty nuances, as well as stone green, grey, beige and milky white, in elegant outfits, played down with casual and baroque touches, which distinguish T-shirts, sweatshirts, jackets and the interior of garments. Coats of arms are a further distinction in this theme, together with a series of new features, especially designed for the boys’ collection. In the main collection for girls, the iconic motifs of the Maison merge playfully or dissolve to form new graphic symbols, broken up with unexpected touches. A PATCHWORK of flowers, fruit, savannah animals or creatures from the depths of the sea is the motif chosen for romantic satin dresses enhanced with ruches and ruffles, cute sundresses, comfy romper suits and fluttering skirts to be combined with a little bomber jacket in crêpe de chine or a lightweight down jacket, alternated with a leather biker jacket and a pair of jeans. The generosity of the print is balanced by the lightness of the chosen colour palette: pink, yellow, pale green and ivory, lit up with gold embroidery and sequins. Animalier patterns are the source of inspiration for the INGRES theme: giraffe or jaguar skins create unique geometries that make room for single, large motifs, sequined decorations or screen-printed imagery. Pastel colours such as aqua green and soft pink tinge plush fabrics, chiffon and taffeta, while gold-laminated leather is reserved for the biker jacket enhanced with studs. Cotton muslins, ideal for the hottest days of summer, and chiffons for special occasions, are the scene of bold bursts of LEMONS. Dresses, skirts, shorts, kaftans and shirts alternate between all-over patterns and single, bold motifs. Animalier prints are back, fresh and summery, strictly in lemon yellow, for light, airy dresses, while white jeans are encrusted with gems, rhinestones and sequins. A world of challenges and heroes, for boys from 2 to 16 years. Creativity takes flight with PEGASUS, drawing jaguars with wings and introducing new looks for jeans, with frequent embroidered inserts. Each pair of jeans is treated with special washes and tears to give a worn look, perfectly attuned to the theme. The leather biker jacket is embroidered all over the back, while the animalier motif on a blue background peeps out from the lining of the tuxedo and waistcoat. Tone-on-tone colour effects, alternated with white, grey, sage green and pastel lime-yellow, are the key to the palette of the OVERLAYS theme. Practical garments with a classic tone, for little travellers returning from a safari, with the imagery and colours of distant cultures. At the height of summer, at the seaside, colours take it up a notch, moving towards SUMMER FLUO tones: energetic, glossy and glassy. Fluo Green, electric blue, lavender grey and optical white in a mix-and-match of images and pictorial touches reminiscent of Basquiat’s graffiti. And of course, for the seaside, lots of costumes, bags and hats for the beach. For city wear, plenty of polo shirts and T-shirt with bold motifs and jeans in prefaded denim, dotted with contrasting stitching. For newborns, fabrics, prints and processes are adapted to ensure absolute comfort and softness. But plenty of room is left for imagination and irony, to the great satisfaction of adults and little ones alike. The 0-24 months collection actually retraces the same themes chosen for older children, scaled-down for mini-sizes and embellished with cute details, creating a veritable wardrobe for little girls, and another for little boys. Once again, animalier prints form a backdrop for shells, seahorses and starfish on dresses and skirts bedecked with flounces, little tops, bomber jackets, and jeans with trimmings and sequins. On T-shirts, stitched embroidery depicts a red heart that encloses flowers, hearts and stars: a motif created by little Maria Eva, one of Roberto and Eva Cavalli’s grandchildren. The giraffe lends its spots to the patterns on bubble dresses and taffeta confetti dresses, and also puts in a cheeky appearance on T-shirt and shirts. Lemons make the ideal motif for a cotton muslin romper suit, little bow-adorned dresses and printed sweatshirts. For boys, once again we see prints brought to life with flying jaguars and lions on motor scooters, as well as a jaguar with the words “little but wild” on a beach T-shirt, mixing up and breaking down the collection’s themes, with bright, almost fluorescent colours. Finally, the proposals for the NURSERY: body suits, shoes, bibs, hats and unisex sleeping bags, in which only the colour of the teddy bear changes, in a choice of pink or blue. The limited edition in ivory white, is screen-printed with gold laminate. Category: Young Tag: pitti bimbo, roberto cavalli.